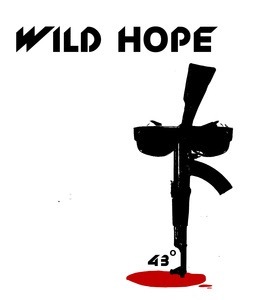 Wild Hope recorded with top producer Gavin Monaghan (The Editors, The Kings Of Leon, Robert Plant ..) and released their first track in June 2011 called "Money And Gold", a critical look at the banking culture. BBC Introducing spotlighted "Money And Gold" as a single of the week. Painters Radio Show had the demo of it in its TOP 5 of 2010. Gavin was at the sliders again for "43 Degrees", a commentary on the plight of refugees. This track was picked out by Tom Robinson for his 6 Music show two weeks in a row. "A sense of real feeling and maturity comes through with each song, suggesting that these guys are in this for the love of music, rather than a desperate search for fame and recognition, which is really refreshing, and works to make them even more worthy of fame and recognition." "There seems to be a lot of great bands coming out of Cambridge nowadays (Violet Bones, Ghostlight, Isaac’s Aircraft – to only name a few) and Wild Hope are one of them."